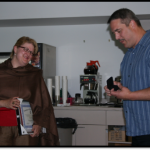 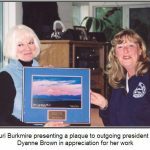 Lauri Burkmire preseting a plaque to outgoing president Dyanne Brown in appreciation for her work. 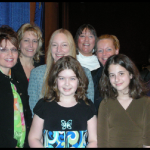 Women Police of Alaska members (and daughters) with Governor Sarah Palin at the Governor’s Prayer Breakfast, March 2008. 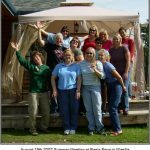 Left to right: Governor Palin, Sherrie Daigle, Andrea Jacobson, Savannah Hudson, Michele Logan, Michelle Bucher, Emily Bucher, and Jackie Conn.
WPA Forever-Treasurer Rae Arno (sitting down with the red hat!) 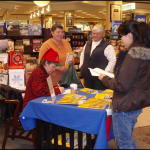 at the book signing for her new book Anchorage Place Names at Barnes & Noble in Anchorage on December 3, 2008. 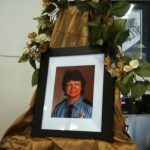 Looking on are retired correctional officers Betty Smith and Judy Tonies. 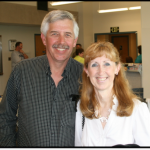 WPA Life Member Shirley Gifford and her husband, Bill at the APOA Crime Conference in Kenai, Alaska, June 2009. 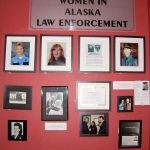 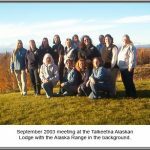 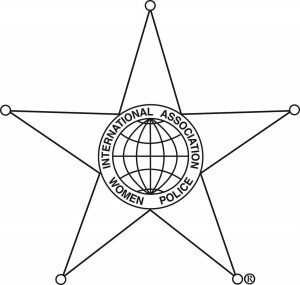 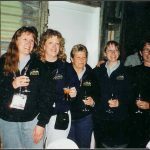 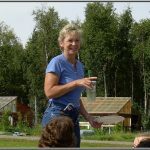 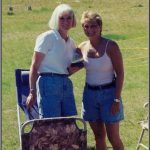 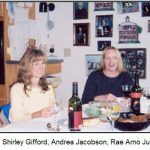 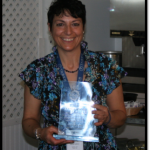 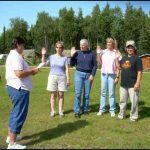 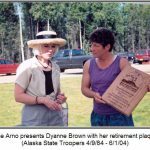 Shirley spearheaded the formation of Women Police of Alaska in 1997. 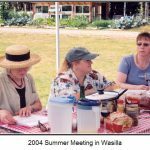 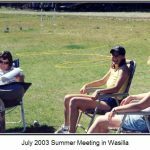 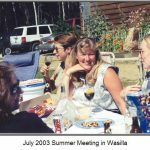 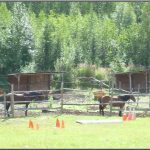 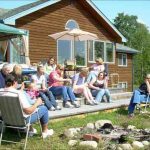 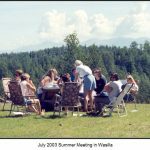 August 1, 2009 – Annual picnic at Wildwood Farm in Wasilla – members gather for a short meeting after the picnic lunch. 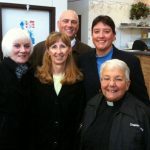 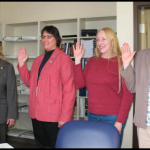 President Michele Logan swears in the remaining board members for 2009-2011; l to r: Tara Tippett, Lana Grist, Sherrie Daigle, Rae Arno. 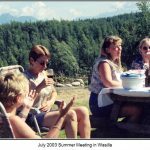 WPA members Lana Grist and Leah Davies, future woman police, Shalea Davies, and Michelle Bucher listen during the membership meeting – August 1, 2009. 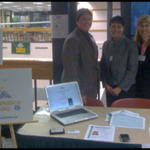 WPA President Michele Logan and WPA members Maxine Andrews and Shirley Gifford “woman” the WPA booth at the UAA Justice Center LE Career Fair on October 22, 2009. 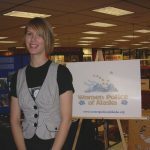 Kelsey Waldorf, 2009-2010 WPA Scholarship winner at UAA. 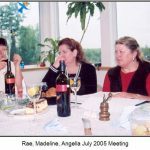 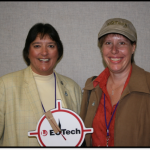 Board members Andrea Jacobson, Tara Tippett and Life Member Shirley Gifford at the annual meeting in Fairbanks AK May 2010. 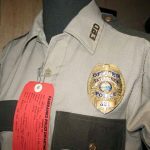 Peggy Sullivan’s shirt and badge in Women in Police Exhibit at FOAST museum.